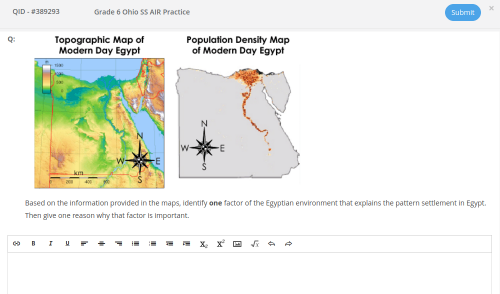 For teachers who are preparing students for the American Institutes for Research (AIR) Assessment state tests, online practice can boost student preparation. AIR practice tests that mimic the online exam can increase student comfort with test mechanics while also checking for student mastery. When students take practice tests online, teachers get immediate insight into student progress, opening the window for immediate intervention. We’ve pulled together a quick list of AIR Practice Assessment tests from our library that you can use to build familiarity. For a complete list of AIR practice tests, enter the term AIR in the search box in the Assessment Library and filter for your grade or subject. As with any test— practice, practice, practice! On top of practice, here are some helpful tips to keep in mind while students are preparing for state assessments. Enjoy! 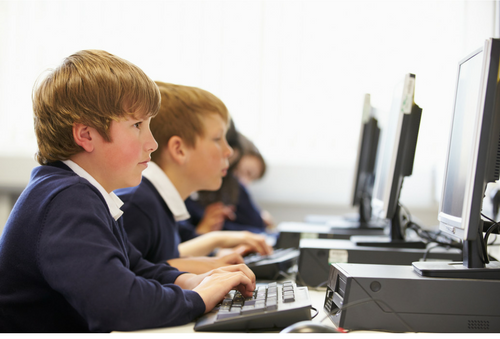 Technology-Enhanced questions such as plotting points on a graph, require students to know how to manipulate the mouse to perform a variety of tech-specific maneuvers. In high-stakes assessments such as AIR they need to do things like drag and drop, fill in boxes on a table, highlight, select and de-select, use drop down menus, activate a video, and even use online calculators. The tech-enhanced questions in Edulastic will give your students the opportunity to practice taking the assessments on a platform that simulates the AIR assessments. 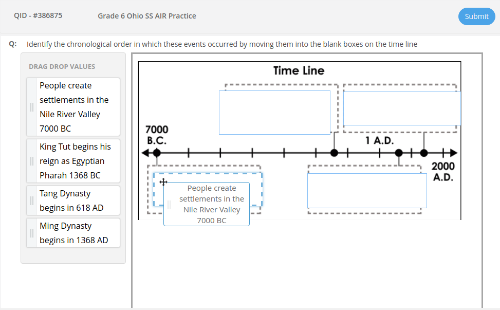 This question below, pulled from an AIR practice test, uses a Drag and Drop item type where students place an event in the proper place on the timeline. With practice on the mechanics of technology-enhanced questions, the students will be comfortable with the format and can focus on content. If your students need a little extra practice focusing on digital assessment question types, consider giving them a fun, low-stakes assessment. To properly answer questions in each section— ELA, Math, Science and Social Studies— the students are required to respond with short answers and some essays. This means students will need experience typing on a keyboard. Students should be familiar with the keyboard’s letters, numbers, delete, space bar, scrolling, etc. For younger students, understanding the keyboard can be a challenge, so exposure to typing time in class will give them the extra advantage at testing time. You can use Edulastic’s Essay question type to practice both short answer or essay responses in class or as outside assignments. Open response question types will also enable students to practice attention to detail when using the keyboard to submit responses. This example, pulled from the same practice test, requires students to respond with a typed short answer. In addition to understanding the map, the students’ keyboarding skills will affect the amount of time it takes it respond. It is true that the current common core-style assessments place a greater value on nonfiction and informational texts than ever before. Being able to understand and analyze these types of articles have a significant place on these assessments. Specifically, about 55% of the reading based questions on AIR are made up of informational and nonfiction texts. Incorporating passages into test practice is crucial to adequately preparing students for the AIR assessment. Edulastic’s Passage Based tech-enhanced questions will give the students exposure to these types of questions and get them used to reading and comprehending online. From there, students can adjust to scrolling through text, locating portions of the text, and responding to passage based questions online. Whether your school uses iPads, laptops or something else, the students should be familiar with the device they will be tested on. Even more specifically, they should be familiar with the device for academic uses— watching YouTube on the iPad isn’t the same as being tested on it. Students should know some basic troubleshooting techniques, such as how to open the browser if it closes and they should have a escalation plan when they need help. Give students practice assessments on the device they will use for the official exam. 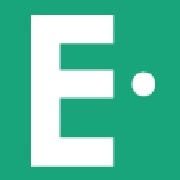 In fact, try taking a handful of Edulastic’s AIR practice assessments ahead of time on the device. Bonus points if you can set up the room and atmosphere to mimic the conditions that students will experience on the official testing day. The students could be sitting at a computer or a device for an hour or more. Depending on the section and the testing environment, being able to tolerate a formal session may be something your students need to work up to. Exposure to working in front of a computer for a lengthy period of time can help them build up the stamina needed complete the tests. Practicing with an Edulastic assignment with 20 or more questions could be an essential tool to building up mental muscle. Ready to practice? Log into Edulastic and start assigning AIR practice assessments to your students!